Albert Einstein’s theory of general relativity is magnificent. For a hundred years, it has consistently predicted all sorts of wacky phenomena scientists have later observed throughout space. One international team is now announcing that a 26-year-long observation campaign has once again confirmed the theory. 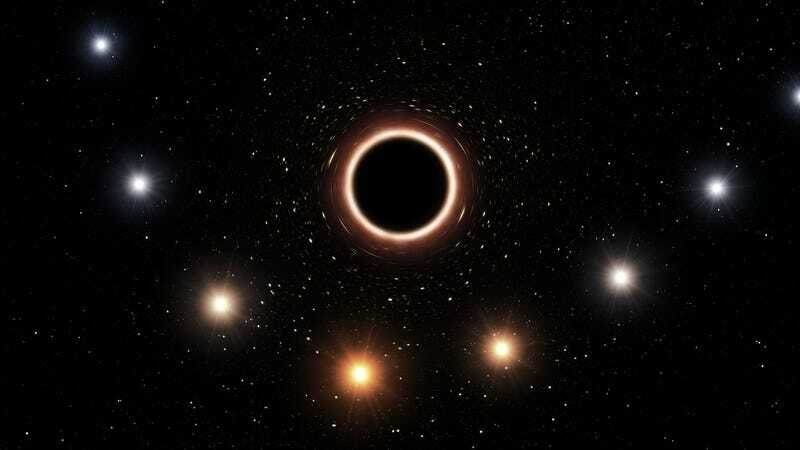 Astronomers using the European Southern Observatory’s Very Large Telescope (VLT) watched a star orbit what is widely presumed to be a supermassive black hole at the center of our Milky Way galaxy. They measured the Doppler effect from the black hole’s gravity pulling on the star’s light—the effect was just what Einstein’s theory predicted. Astronomers have monitored a star called S2 with the Very Large Telescope since 1992, hoping to use it as a probe of the gravitational field at the galaxy’s center. The star orbits Sagittarius A* (pronounced A-star), a source of radio waves believed to be a black hole 4 million times the mass of the Sun, at a distance three times that between Earth and Pluto. But given Sag A*’s immense gravity, S2 completes its orbit in just 16 years, traveling at a maximum 7,650 kilometers per second, around 17 million miles per hour. In an environment like this, the star should behave as predicted by Einstein’s theories of special and general relativity. Isaac Newton’s older, simpler laws of gravity lose their accuracy when applied to these extreme systems. Beginning in 2016, the researchers began watching S2 with a powerful four-telescope instrument called GRAVITY as the star neared its May 2018 closest approach to Sag A*. The black hole warped space such that the star’s light waves stretched, as predicted by Einstein, according to the paper published in Astronomy & Astrophysics. This is impressive stuff. “The study is carefully done, and it is amazing to see how much the precision of the data has improved in the last two decades as instrumentation has gotten better,” Ingrid Stairs, a physicist from University of British Columbia who was not involved in the study, told Gizmodo. She also pointed out that astronomers are excited about a side effect the authors presented with their paper: a new precision measurement of the Sun’s distance from the galactic center: 26,490 light-years, give or take a few. Why do scientists keep testing general relativity? It’s a rock-solid theory that hasn’t failed us for over a hundred years. But there are still many unexplained mysteries throughout the universe. Some hope the answers to these mysteries might live in tiny deviations between general relativity’s predictions and what scientists actually observe.